You'll be £12.99 closer to your next £10.00 credit when you purchase Nijmegen. What's this? Order within the next 2 hours, 19 minutes to get your order processed the next working day! Following on from BHTV's earlier film in the Market Garden series on the story of Hell's Highway, the series reaches the battle to seize the great Bridges over two of Europe's largest water ways; the Maas and the Waal at Nijmegen. Here the 82nd US airborne were, as elsewhere, denied coup de main attacks to seize the bridges by the air commanders. While the Grave Bridge was captured, confusion in US orders meant that the barely defended bridge in Nijmegen was only attacked when the Germans had taken the opportunity to reinforce the garrison. The resulting battle to regain control of the situation is an epic of Anglo-American military history. With the 10th SS Frundsberg Division marching south to block the Allied advance, the British Guards Armoured Division delayed by a blown bridge on Hell's Highway arrived and were pitched into a quick attack fighting alongside the American Paratroopers but this quick attack failed to grab the bridges. A better organised and supported attack was needed the following day. The key was to be a river crossing by 3rd 504th Parachute Infantry that British General Miles Dempsey described as he watched as 'unbelievable'. With the Guards and 82nd closing in on the bridges from both sides the German defence crumbled. Even though the Bridges were in Allied hands the 82nd was being assailed by counter attacks from every point of the compass and Hell's Highway had been repeatedly cut behind them and the life blood of an armoured division was being choked off.rnrnOur team of expert soldier/historians explain this amazing story in impeccable detail whilst not avoiding the controversies of this battle, which are so often divided on national lines, and have concentrated on military logic to cut to the truth. The DVD also boasts the first on screen interview with Lord Peter Carrington who crossed the Nijmegen Bridge with the first wave of British tanks. One of the five books in the superb Battleground series devoted to Operation Market Garden, focusing on the very broad and difficult sector allocated to the 82nd Airborne Division. The chapters describe the key areas from South to North, including Grave Bridge, the bridges over the Maas-Waal Canal, the Groesbeek Heights, Nijmegen, and many more besides. As with all books in this series, a considerable number of maps, photographs and first-hand accounts have been packed into a deceptively small space, and the concise narrative manages to go into a level of detail which makes this a solid historical study rather than just a battlefield guide. A fine tribute to the "All American" 82nd, a Division which General Dempsey of the 2nd British Army described as the finest in the world at that time. 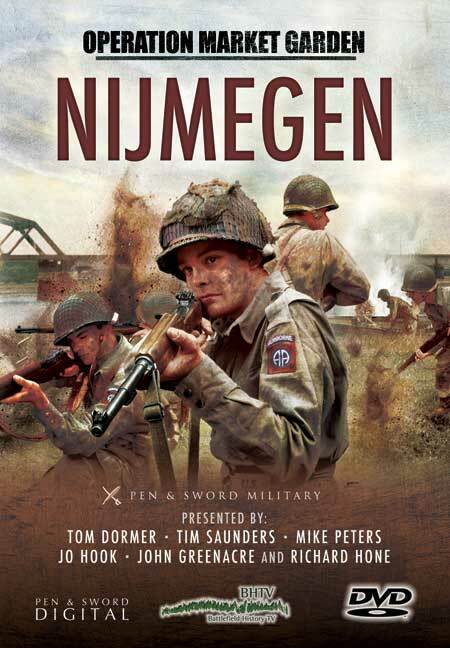 In this splendid DVD, historians walk the ground and explain each phrase of the battle as it unfolded, from the landings on the Groesbeek Heights and the successful capture of Grave Bridge to the struggle by the Americans and the Grenadier Guards to secure Nijmegen, culminating in the famous assault crossing of the River Waal by the 3rd Battalion 504th Parachute Infantry Regiment; an action which was universally acclaimed by observers as the most remarkable and courageous that they has witnessed. Highly recommended. This film details the epic tasks faced in the battles to seize the two bridges over Europe's largest waterways; the Maas and Waal rivers of Nijmegen. The mistakes that were made included denying the 82nd Airborne the coup de main attacks to seize the bridges. Grave bridge was captured but confusion in orders and delays meant that the sparsely defended bridge at Nijmegen was only attacked after the Germans had been given the opportunity to reinforce their troops there, leading to an epic and tragic battle.